Lately I’ve been digging through some Classics. If you’ve read any of my books, you know I keep returning to these beloved favorites. I return to them, again and again, because, not only are they beautifully written, but they’ve endured for so many centuries by touching upon truths that remain vibrant — and true — today. We recognize ourselves in these stories – or we find something new that we finally acknowledge was always present. characters, but I do like how they’re expressed. Jane Austen’s Persuasion. Yes, I know return to this again and again, in both reading and writing. I may be up to fifteen readings by now… One would think I’d get enough of it, yet I never do. Austen is brilliant at laying out a huge character struggle within a small framework. The magnitude of her genius almost gets lost in the precision of her work. Well… It doesn’t. We know how how great she is. Persuasion remains my favorite because Austen stretches in a different way here. She is more sparse in some respects yet there’s a pain and poignancy. There is such pressure on Anne Elliot, the main character, that I keep revisiting her story to find out how Austen made me feel all the tension without spoon-feeding it to me. I’m also reading some contemporary works: Seven Women by Eric Metaxas and A Gentleman in Moscow by Amor Towles at present. Both are extraordinary — I highly recommend them. What are some of your favorite Classics? Or do you read Classics at all? And… Do you have contemporary suggestions for me? I am always looking for the next great read! ← Sharon Lathan celebrates Darcy & Elizabeth: Hope of the Future! Excerpts + a GIVEAWAY! I just read Vanity Fair and I have to say it was one of the best books I’ve ever read, classic or modern. The prose is amazing, thr story is great and the characters are so well written you feel like you know them. Also, for a male writer, it was one of the best written, most realistic female social worlds I’ve ever read. I have spent quite a bit of time this summer with some classics too. I read Middlemarch (which is an amazing experience!) and Rebecca (but I didn’t love the ending) and I also became somewhat obsessed with E.M. Forster, as I reread A Room with a View (watching the movie again makes me enjoy the book even more) and then onto Howard’s End (and a first viewing of the fabulous movie too!). Austen and Forster have so many similarities between them and reading My Life in Middlemarch by Rebecca Mead made me develop a great respect and admiration for George Elliott as a writer and as a woman. I am now listening to The World Broke in Two, which is about the year that changed literature as these writers “Invented the language of the future.” Progressing this way through English literature , Austen-Elliot-Forster, has allowed me to understand a bit more about the longitudinal influences of British Literature and the changing world that these authors struggle so hard to share with their stories, shape with their themes while hoping to make the world a better place for all of us. Not sure which classic I will read next, but I enjoyed reading about the ones you read. I love Jane Austens books and I love a Christmas Carol as well. I have read The Great Gatsby too. 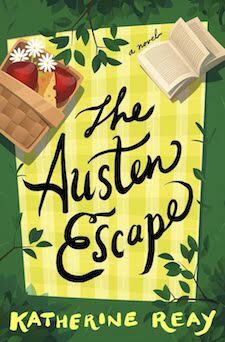 I can’t wait for the Austen Escape! The classics I enjoy most besides Jane Austen’s works are those of Charles Dickens. I enjoy most of his works although Our Mutual Friend and Little Dorrit are my favorite ones. I too love Dickens! Thanks for reminding me of him! I agree! And I love A Christmas Carol. The fact that it has many adaptations certainly doesn’t deplete it’s power. I like to dive back into the classics (and we all have our own definition of classics) to immerse myself in great writing. I always told my student athletes at Benedictine that reading was “film” for writers. Reading great writing helps me see my own weaknesses. However, it is to taste. For instance, Vargas Llosa’s “Conversation in the Cathedral” is not for everybody any more than Kwame Apiah’s “In my Father’s House” may be. James Salter is a wonderful tri[ into the interior discourse. While undeniably male, Wolfe’s “Right Stuff” shows a remarkable understanding of the novelization of fact. Going backwards…”Middlemarch” by George Eliot and Galsworthy’s “Forsyte Saga” offer English prose beyond compare. Of course, if tasked to bring one author with me to a desert island…any of the books I own by Somerset Maugham would do for great structure, plot and use of language. I like the way you think. The Forsyte Saga has been recommended again and again to me. It’s now time I picked it up. Thank you! Thanks to the free books at BookBub, I don’t read many classics anymore. I have 160 books on my Kindle waiting to be read, and that doesn’t include the others that I send to my Kindle for PC for “later” perusal. I have found some books / series that I like – and would never have found otherwise – but I’m not sure some of them are for everyone (depends on what you find “offensive”). One series I like is the “Lost and Found” series by J M Madden; the MC are wounded warriors. Another set I like is “Psychic Visions” by Dale Mayer, if you like that kind of thing. Other than JA, not sure if I will ever have the time to get back to any other “classics”.